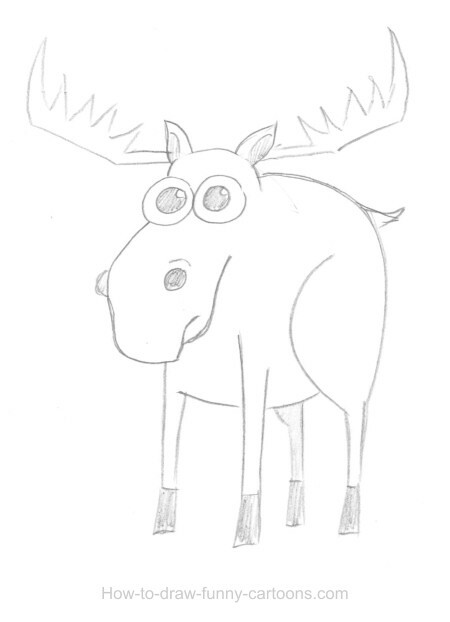 Moose drawings are fun to create. This adorable cartoon character often looks either mean, slightly dumb or suspicious. 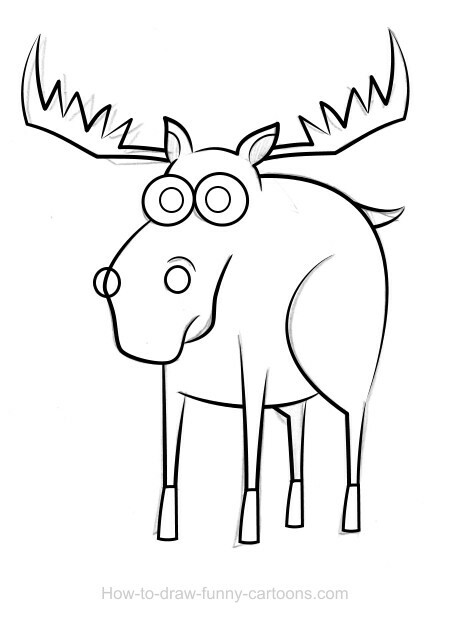 In this case, I decided to draw a moose with large eyes and tiny legs. The moose is very present in North America, especially in Canada. 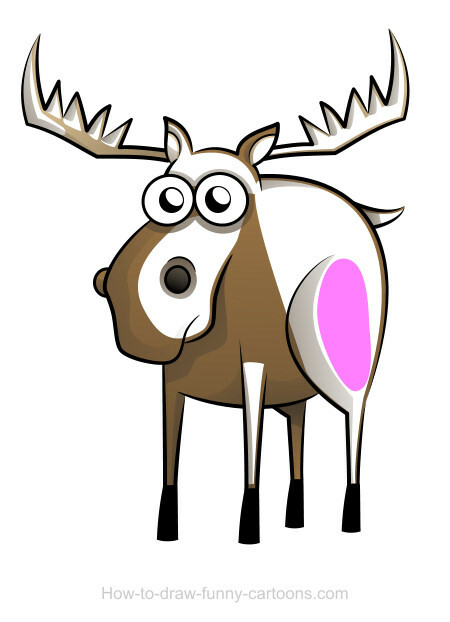 Easily recognizable with its large Antlers (for the male anyway), it is quite easy to draw this cartoon animal and have a result similar to the real thing. Let's start this drawing lesson by creating a sketch of the character. If you have a tablet, you can sketch directly to your computer. 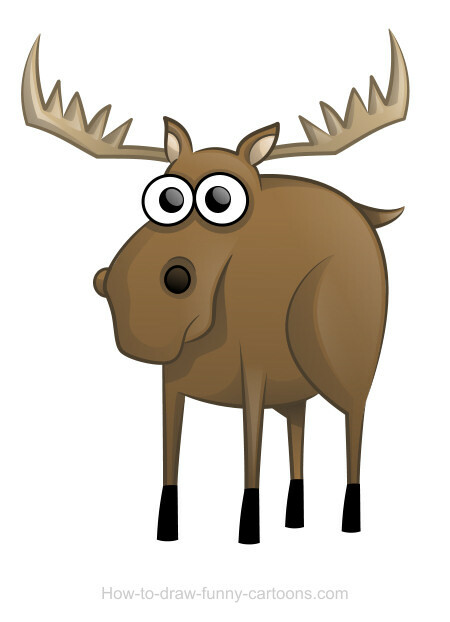 Like I said earlier, I tried to create a funny moose with large pupils, tiny legs and a cute tail. When you are done, convert your drawing into a digital file (if you used a pencil and a piece of paper) and import the illustration on your computer. Then, open your vector software and add dark lines just like shown in the image above. Create a new layer and place it behind the first two. Then, create new shapes and add plain colors for now. The goal is to separate the outlines and the plain shapes since shadows will be added between these two layers later on. Select the gradient tool from your vector software and add a subtle effect on each element of the cartoon character. Remember that the bottom part of each shape must be darker. When you are finished, create a new layer between the outlines and the plain shapes (that are now filled with gradient colors!). Add new dark shapes to represent strong shadows. Our goal is to add more depth to the moose. Select the transparency tool and partially hide the top part of each shape added previously. Shadows are now subtle, but still strong enough to give more volume to the illustration. Shadows are nice, but adding reflection to our moose drawings can definitely give a better result. To create reflection, simply add a new layer. Then, create new shapes that are colored in white. The pink one was added so that you could see the white shape positioned over another white shape. Once again, select the transparency tool and partially hide the bottom part of each white shapes created previously. Highlights are subtle since the skin of the moose doesn't reflect light like plastic would (it's just an example).